February 3, 1926 to May 16, 2018: Gertie stayed busy helping on the farm and was involved in many church activities, including involvement in the St. Louis altar society. Gertrude "Gertie" Pauline DeConinck was born to Leo and Rosa Schuemmer on February 3, 1926 in Sherwood, Oregon. Gertie passed away peacefully on May 16, 2018 in Salem. She married Andy DeConinck February 5, 1949. They settled in the Gervais/St. Louis area where they farmed grass seed and row crops. Andy and Gertie raised their four children, Ron (Joan), Nancy (Pat) Schaecher, Diane (John) Schindler and Karen (Recep) Ozcan on the family farm. They were blessed with 12 grandchildren and 15 great-grandchildren. She was preceded in death by her husband, Andy, her parents and 5 sisters. As she raised her family, Gertie stayed busy helping on the farm and was involved in many church activities, including involvement in the St. Louis altar society. Andy and Gertie also enjoyed participating with friends in a square dance group. As her children grew up she found time for new activities. Gertie was one of the original members to take an hour of adoration at the Sacred Heart Chapel. 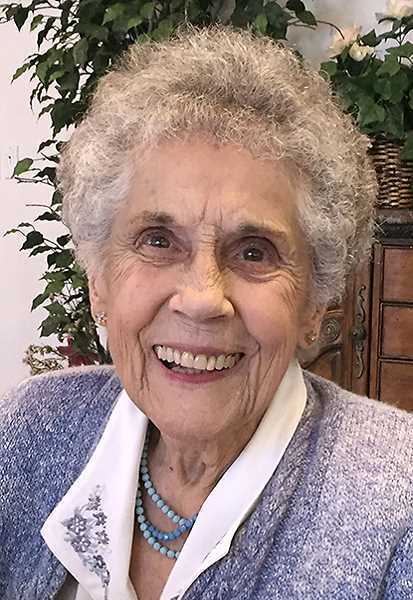 She worked at the St. Luke Food Bank, was a member of Catholic Daughters and volunteered at St. Luke and Sacred Heart Schools reading with children, assisting in the classroom and working in the library. Her faith was very important to her and for many years she attended morning mass daily. She also belonged to a quilting group at St. Luke and volunteered with the Red Cross. Gertie didn't have many hobbies, but born a farm girl, loved working outside on the farm and keeping her yard in town tidy. She never seemed to tire and would work circles around her daughters until the last few years. The family would like to thank Dr. Pierce, Nurse Kelly, and staff; Salem Hospital staff; Salem Hospital Transfusion Lab; Darlene Meier from Queen of Peace Catholic Church for her weekly visits; and Serenity Hospice. Our heartfelt thanks to Premier Homes and her caregivers, Angie and Leah for the loving way they cared for her. Their dedication to mom's wellbeing meant so much to our family.